Product information "HAIX Black Eagle Safety 40.1 low black/poison"
For everyone who works as a [Beruf]: HAIX HAIX Black Eagle Safety 40.1 low black/poison meets the highest safety standards. This is essential, because you need workwear you can rely on to do your job. Safety footwear prevents injuries and ensures that you feel comfortable. This is a boot which fulfils the requirements of S3 and makes a major contribution towards ensuring health and safety at work. The safety shoes are electrostatically dissipative. This means that the shoes meet the requirements of the ESD standard DIN EN 61340-4-3:2002. The anatomically shaped, ultra-lightweight protective cap made of fibre-reinforced plastic meets the highest safety requirements. A puncture-resistant, flexible and metal-free sole prevents pointed objects such as nails from penetrating into the shoe. The shoes are completely metal-free. 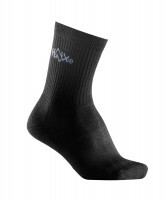 The insole is comfortable, cushioning, moisture-draining, antibacterial and washable at 30 °C. 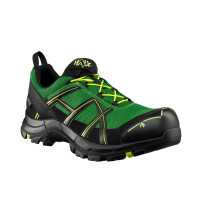 The separate heel cup provides good cushioning and foot guidance. "AIRFLOW" channels. The three different insoles make the shoes suitable for different foot shapes. The article will be shipped with the red inlay (medium)! You can order additional Vario Fit insoles here. The GORE-TEX® membrane makes the shoes both waterproof and extremely breathable: liquid does not penetrate the HAIX Black Eagle Safety 40.1 low black/poison ® moisture is reliably transported to the outside. The work shoes are approved for orthopaedic fitting without losing their safety certification. The breathable materials warmth and moisture through to the outside. A slip-resistant antistatic sole insulates against cold and heat. The shoe is made of high-quality, breathable microfibre/textile. Thanks to the quick-release fastener, you simply put on the shoes and adjust them optimally to your foot shape. Just pull up ® ready. 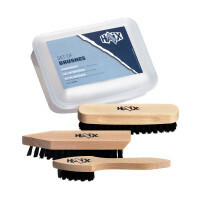 The rubber toe cap made of abrasion-resistant material protects your HAIX shoes additionally. The polyurethane (PU) midsole is particularly elastic and distributes the pressure optimally on uneven surfaces. At the same time, it will reduce any strain on the joints and back by cushioning your steps as you walk.